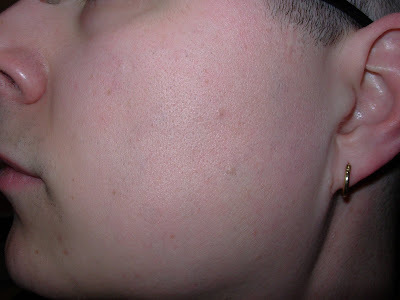 Some of you reading this blog may have seen entries in the past talking about my experience with laser hair removal. After 30 treatments, I’m “done” and here are the results. 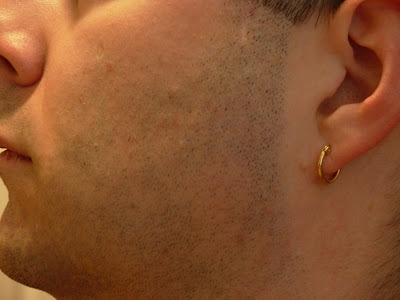 I did laser hair removal because my beard was so thick and coarse that I was having all nature of problems. I’d get really bad ingrown hairs if I let it get too long so my dermatologist told me I’d always have to be clean shaven or suffer the consequences. I destroyed pillowcases and the necks on my shirts. Since I had to keep it shaved anyway, I figured, why not get it removed? Here are the links to the various blog entries from the treatments I documented: 1, 2, 3, 5, 6, 7, 9, 11, 12, 26. I didn’t keep a timeline of photos after each treatment because… well, I didn’t really think about it, to be honest. I did do before and after, though, so here’s that. 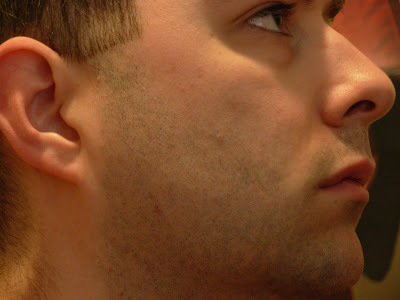 You can see there’s a little bit of “patchiness” in the chin and a little on the sides. You can also see a couple of my famous ingrowns. You’ll notice that between treatments three and four there wasn’t much change. It seemed that way for quite some time in the beginning. At that point we were using the Dermo Flash IPL (intense pulsed light) - it was good for thinning things down, but isn’t quite as effective at getting the thicker, coarser hair like I have in my beard. It was still important to do this, though, because using a laser to start (we tried a little in my first treatment) with was so insanely painful that anything to reduce the amount of hair that would be hit eventually by the laser was a good thing. In the fifth treatment I resumed use of the actual laser (a MeDioStar) and it hurt like hell, but started getting better results. In later treatments, I think around the #18 time, we started alternating between a MeDioStar laser and a Syneron eLaser which shoots not only laser at the hair but also a pulse of radio frequency. 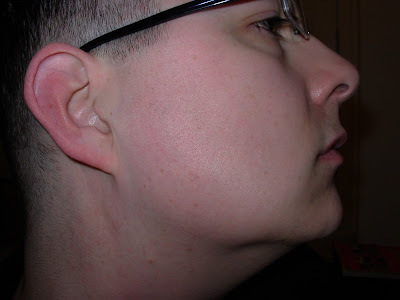 You’ll notice that the sides and neck are pretty well clear, but there’s still some lingering around my lips and chin. The upper lip is the most painful area to get, so we didn’t focus as much on it as we probably could have. You also can’t get too close to the lips because you don’t want the laser hitting them. 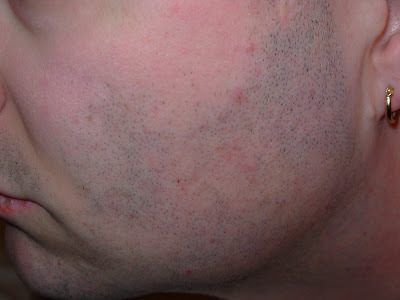 The chin was a stubborn area to begin with because the hairs are so plentiful and are at their thickest/coarsest there. After about 26 treatments I started seeing diminishing returns so I decided after the end of my 30th I’d call it “good enough.” I don’t ruin shirts anymore, it doesn’t look patchy at the end of the day, and I’m free of ingrowns. Basically, success. Prepare for the long haul. The clinic might sell you treatments in bundles of six or something, but you will probably need more than that, particularly in areas you have more hair and/or where the hair is coarse. It hurts a LOT. I can’t understate this. You may hear people tell you “it’s like a rubber band snap.” The Dermo Flash IPL is actually like that - a quick snap and you’re done. (For me, about 10 quick snaps and you’re done.) On the other hand, it’s only really effective on the thinner hair, so if there’s any significant amount of hair, you’ll probably need something stronger like a laser. Lasers hurt really bad. I’ve heard of guys who have full back tattoos and have had laser hair removal and they said the laser hair removal hurt more. I don’t have any tattoos so I can’t vouch for that, but I think that says something. I can’t express it in words, really. It’s not like any other kind of pain I’ve experienced. Particularly in early treatments when there’s a lot of hair, it’s instant-eye-watering-please-I’ll-tell-you-anything-just-stop kind of pain. Once you get further in, it eases up, but some things still hurt. My upper lip makes me wince just thinking about it. It only works well on dark hair. The basic premise of the thing is that the laser heat is drawn to the hair pigment. The heat transfers down through the hair and cooks the root. If you have blonde hair on light skin, you’re kind of hosed because there’s not much pigment for the heat to be drawn to. If you have dark skin, the heat can’t really differentiate between the hair pigment and your skin pigment. What this means for me is that areas where my beard was “salt and pepper” is now just “salt” - I have a few spots where there is some thick, coarse white hair. Laser hair removal will never get that. Once you start, you’re committed. This is more for the folks doing visible areas like the face, but it’s good to be aware of. When the hair starts coming out, it’s not necessarily “even.” There were points where my beard looked a little like a zebra pattern because the hair was coming out in odd swatches. This lasted for around 15 treatments in the middle of my full series of treatments. Had I decided to quit, I’d have a really weirdly growing beard that you’d even notice when it was shaved. Once they start removing hair, you’re committed to the whole procedure, as long as it takes, because if you quit before the hair’s all gone it’ll be weird. You will not end up hairless. You will still have to shave. I did not fully realize this at the outset, but I can see that it’s somewhat unavoidable. The combination of diminishing returns as I neared the 30th treatment and the white hairs in my beard that weren’t going to be removed anyway means no matter what I do, I’m still shaving. I have to assume that’s the case for anywhere - it’ll thin the hair down a lot, maybe enough that you don’t have to shave as often, but you’ll still have to shave. Given all that, would I still do it? Yeah, I think I would. I like being able to look down and read a book in the evening without giving my own neck a rash or pilling up my shirt. I like being able to lie down and roll over without hearing a sandpaper noise that indicates my face is destroying another pillowcase. Just go in informed and knowing that it’s not going to be six months of pain-free treatments and you’ll be fine. Note: I get a lot of comments on my laser hair removal entries that are spam, people trying to sell laser hair removal, or people telling me that their laser hair removal clinic would have done a better job. I will delete these non-constructive comments, so please save us all some time by not leaving them. Have I had any regrowth? A bit, but not a ton. My cheeks and neck are still really clear, just like in the photos. 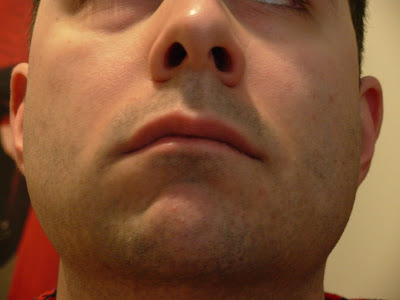 If I’ve had regrowth, it’s been in my lip/chin region, which, as you can see, didn’t come clear anyway. Do I have to shave? Yes. 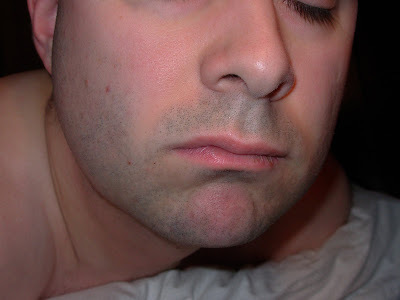 I’ve always had to shave, even immediately following treatment. You won’t end up hairless. Does it look patchy? Not as long as I stay shaved. Again, you don’t end up hairless, so you will have to keep yourself shaved. When I’m shaved you’d never notice that I had anything done at all except that I don’t have that super-dark beard line I used to have. 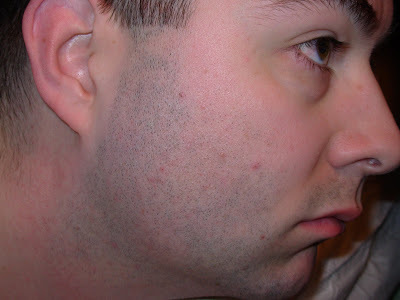 When I wake up in the morning it is a little patchy looking, but not too bad. I wouldn’t go a full day or more without shaving, though. Does it look feminine? Not from what I can tell. Like I said, it just looks like I’ve shaved. 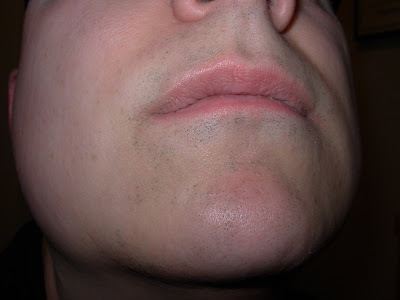 Shave your own face and decide if you look feminine. That’s your answer. Would I do it again? Yes. I can’t tell you how much of a pain it was to be tearing up my shirt necks and sheets and such with the beard I had. Not having to deal with that has been worth it. I’ve spent the last week working on getting NCover 3.4.2 (and, later, 3.4.3) working in my environment. I was previously using the older free NCover with the original NCoverExplorer reporting tasks, but in moving up to .NET 4, it was also time to move up to a newer NCover. One of the shortcomings I’ve found with NCover is that it’s really hard to get a simple set of summary coverage numbers from inside the build script. It’s pretty well geared around dumping out reports and summaries in XML or HTML, but even then, the XML summaries don’t have all the numbers in an easily consumable format. Further, the new division between the “Classic” licenses (ostensibly for the everyday dev) and the “Complete” licenses (for your build server) give us the fact that only the “Complete” license supports failing the build based on coverage. I’m not sure why, that’s just how it is. Oh, and the “Complete” license costs over twice what the “Classic” license costs, so it’s a little cost-prohibitive to buy all your devs a “Complete” license just so they can fail a local build. Unfortunately, that doesn’t really work for me. I’m going to run unit tests on my local machine before I check my code into the repo so I don’t break the build. I kind of also want to know if I’m going to break the build because I went under the minimum coverage requirements. Fortunately, you can do this, it’s just a little tricky. You’ll have to stick with me while we jump through a few hoops together. Run your tests with the <NCover> MSBuild task and get your coverage numbers. Run the <NCoverReporting> MSBuild task to create a “SymbolModule”summary report. Use XSLT inside the <NCoverReporting> task to transform the output of the “SymbolModule” report into something you can more easily use with actual coverage percentages in it. Use the <XmlPeek> task to get the minimum coverage requirements out of the MSBuild script. Use the <WriteLinesToFile> task to create a temporary XML file that contains the minimum coverage requirements and the actual coverage information. Use the <XslTransformation> task to transform that temporary XML file into something that has simple pass/fail data in it. Use the <XmlPeek> task to look in that simplified report and determine if there are any failures. Use the <Error> task to fail the build if there are any coverage failures. If this seems like a lot of hoops to jump through, you’re right. It’s a huge pain. Longer term, you could probably encapsulate steps 4 – 8 in a single custom MSBuild task, but for the purposes of explaining what’s going on (and trying to use things that come out of the box with MSBuild and NCover), I haven’t done that. You may get lost here. Like I said, it’s a huge number of steps. At the end I put all the steps together in an MSBuild snippet so it might make more sense when you get there. I’ll walk you through the steps, and then I’ll show you the summary. Follow all the way through to the end. If you get bored and start skipping steps or skimming, you’ll miss something. Your build script will have some properties set up and you’ll use the <NCover> task to run NUnit or whatever. I won’t get into the details on this one because this is the easy part. In this example, when you run the Test target in your MSBuild script, NUnit will run and be profiled by NCover. You’ll get a data file out the back called “Coverage.Unit.xml” - remember where the coverage file output is, you’ll need it. I recommend setting an MSBuild variable with the location of your coverage file output so you can use it later. At some time after you run the <NCover> task, you’re going to need to generate some nature of consumable report from the output. To do that, you’ll run the <NCoverReporting> task. For our purposes, we specifically want to create a “SymbolModule” report since we will be failing coverage based on overall assembly statistics. Now, there are a few interesting things to notice here. There’s a variable called “SimplifiedReportXsltPath” that points to an XSLT file you don’t have yet. I’ll give that to you in a minute. SimplifiedCoverageReportPath will eventually have the easy XML summary of the stuff we’re interested in. Keep that around. SimplifiedCoverageReportOutputs variable follows the format for defining a report to generate as outlined in the NCover documentation. NCover Classic doesn’t support many reports, but SymbolModule is one it does support. The SymbolModule report is defined as an Html format report rather than Xml. This is important because when we define it as “Html” then the report will automatically run through our XSLT to transform. The result of the transformation doesn’t actually have to be HTML. The MinimumCoverage variable is defined in the format used to fail the build if you’re running under NCover Complete. This format is also defined in the documentation. The parameter as passed to the <NCoverReporting> task will be ignored if you run it under Classic but will actually act to fail the build if run under Complete. The point here is that we’ll be using the same definition for minimum coverage that <NCoverReporting> uses. An XsltOverridePath is specified on the <NCoverReporting> task. This lets us use our custom XSLT (which I’ll give you in a minute) to create a nice summary report. Basically, you need to create a little XSLT that will generate some summary numbers for you. The problem is, you will have to do some manual calculation to get those summary numbers. You can get the USP and VSP numbers for the entire coverage run or on a per-assembly basis by looking in the appropriate places in the SymbolModule report. If you’re only reporting some statistics, you’re pretty much done. The special __Summary module is the overall coverage for the entire test run; each other module is an assembly that got profiled and its individual coverage. You could use the <XmlPeek> task from here and look in that file to dump out some numbers. For example, you can report out to TeamCity using a <Message> task and the __Summary number in that XML report. However, if you want the build to fail based on coverage failure, you still have to compare those numbers to the expectations. More crazy stuff going on here. First we have to define the MSBuild namespace on the <XmlPeek> task so we can do an XPath statement on the $(MinimumCoverage) property - again, it’s an XML blob. Next, we’re specifying some “XmlContent” on that <XmlPeek> task because we have the variable already and we don’t need to re-read it from the file. However, it’s sort of an XML fragment because there may be several <Threshold> elements defined in the variable so we wrap the variable with a <Root> element so it’s a proper XML document. The “Query” parameter uses some XPath to find all of the <Threshold> elements defined in $(MinimumCoverage) that are assembly-level thresholds. We can’t really do anything with, say, cyclomatic-complexity thresholds (at least, not in this article) so we’re only getting the values we can do something about. Finally, we’re sticking the <Threshold> nodes we found into a @(ModuleCoverageRequirements) array variable. Each item in that array will be one ` node (as an XML string). As you can see, we’re generating “yet another” XML document. It’s temporary, so don’t worry, but we do generate another document. Finally, we use <WriteLinesToFile> to wrap some XML around the requirements and the actuals and generate a larger report. Notice we stuck a “.tmp” extension onto the actual file path in the “File”attribute on <WriteLinesToFile> - that’s important. We need to take that temporary report and make it a little more easily consumable. We’ll use another XSLT to transform it. What that XSLT does is look at the requirements and the actuals in the XML file and if it finds some actuals that match a defined requirement, it outputs a node with the name of the assembly, the expected and actual coverage percentages, and a simple pass/fail indicator. The reason it doesn’t just include all of the requirements is that NCover Classic doesn’t allow you to merge the results from different test runs into a single data set. As such, we may need to run this transformation a few times over different data sets and we don’t want to fail the build just because there’s a requirement defined for an assembly that wasn’t tested in the given test run. As an input, we’re taking that “.tmp” file we generated with <WriteLinesToFile> earlier. The “OutputPaths” attribute is the $(BuildCheckCoverageReportPath) that we defined earlier. The “XslInputPath” is the XSLT above. The top-level __Summary data is gone (because we’re only dealing with assembly-level requirements) and you can see easily what the expected and actual coverage percentages are. Even easier, there’s a “pass” attribute that tells you whether there was success. Notice in my sample report that one of the assemblies passed and the other failed because it didn’t meet minimum coverage. We want to fail the build when that happens. The .tmp file will be deleted. The $(SimplifiedCoverageReportPath) will now be that final report with the pass/fail marker in it. That gives us a new variable called @(FailedCoverageItems) where each item in the variable array has one node containing a failed coverage item. If we put all of the MSBuild together, it’ll look something like the following. NOTE: THIS IS NOT A COPY/PASTE READY SCRIPT. IT WILL NOT RUN BY ITSELF. IT IS A SAMPLE ONLY. There are exercises left to the reader. THIS IS NOT A COPY/PASTE READY SCRIPT. There are some obvious areas where you’ll need to make some choices. For example, you probably don’t actually want to dump all of these reports out right in the same folder as the MSBuild script so you’ll want to set various paths appropriately. You may want to put the <NCoverReporting> task call in a separate target than the crazy build-time-analysis bit to try and keep things manageable and clean. Filenames may need to change based on dynamic variables, like if you’re running the reporting task after each solution in a multi-solution build, so you’ll have to adjust for that. This should basically get you going. Remind me again… WTF? Why all these hoops? NCover Classic won’t let you fail the build based on coverage. I have my thoughts on that and other shortcomings that I’ll save for a different blog entry. Suffice it to say, without creating a custom build task to encompass all of this, or just abandoning hope for failing the build based on coverage, this is about all you can do. Oh, or you could buy every developer in your organization an NCover Complete license. HELP! Why doesn’t XYZ work for me? Unfortunately, there are a lot of moving pieces here. If it’s not working for you, I don’t really have the ability to offer you individual support on it. If you find a problem, leave a comment on this blog entry and I’ll look into it; if you grabbed all of these things and your copy isn’t quite doing what you think it should be doing, I can’t really do anything for you. From a troubleshooting perspective, I’d add the various build tasks one at a time and run the build after each addition. Look and see what the output is, what files are created, etc. Use <Message> and <Error> tasks to debug the script. Make sure you’re 100% aware of what each call does and where every file is going. Make sure you specified all the properties for <NCoverReporting> correctly and you didn’t leave a typo in the minimum coverage or report output properties (e.g., make sure the SymbolModule report is an “Html” not “Xml” report, etc.) There are a lot of steps, but they’re simple steps, so you should be able to work through it. Also, drop NCover a line and let them know you’d be interested in seeing better direct support for something like this. I’ve told them myself, but the more people interested in it, the more likely it will see light in the next product release. It was once again time for new barkdust, so, just as we did a couple of years back, we called Grimm’s Advanced Bark Blowing and got our one unit of medium fresh fir. It was still $295, just as it was two years ago, so it was nice to see the prices didn’t go up. Flowerbeds are looking nice again. Now we just have to go out and dig out the sprinkler heads since they’re buried in… barkdust. Generally speaking, it’s good practice to develop as a non-administrative user so you can make sure your applications will run for non-admin users and so you won’t do any damage to your environment as you develop. Unfortunately, some things end up forcing you to develop as an admin because they require rights that most non-administrative users don’t have. Typemock Isolatorno longer has to be one of those things that forces you to run as an administrator. The Isolator install guide has a “Security” section that outlines the various registry keys and files that Isolator needs read/write access to. If you give your non-admin user the rights to these keys and files, that non-admin user can start, stop, and link Typemock Isolator with other profilers. In a recent round of troubleshooting, I ended up writing a program to modify the ACL on the requisite keys and files as found on the target machine. The result is EnableTypemockForNonAdmin - a command-line program that automates this permissions setup process. This program will make permissions changes to files and your registry. Read the enclosed readme file and make sure you fully understand what’s going to happen before you run it. Usage is simple. Open a command prompt as an administrator and run the program, passing in the name of the non-admin user you want to have access to Typemock Isolator. Standard disclaimers apply - I’m not responsible for any damage done by the program; YMMV; use at your own risk; etc. UPDATE 5/5/2010: I verified that with Typemock Isolator 6.0.3 and NCover 3.4.3 the registry additions provided by Jamie Cansdale will allow you to run as a non-admin user (both using the Typemock Config Tool and TestDriven.NET), though I can’t speak to earlier versions of Isolator or linking with profilers other than NCover. These keys are also custom additions to your registry, so it’s a little “non-standard.” YMMV. I think the permissions change is probably the route I’ll continue to go until the profiler companies and/or Typemock start shipping these tweaks as supported items out of the box. UPDATE 1/20/2011: Typemock Isolator 6.0.6 now requests read/write permissions on the registry key where the license info is kept right when the config tool starts up, regardless of whether you’re going to modify the value. I updated the EnableTypemockForNonAdmin tool to version 1.0.1.0 and added that registry key to the list of keys to give your non-admin user permissions to. Download now - free!